Posh chairman Darragh MacAnthony (left) with director of football Barry Fry at Coventry on Saturday. 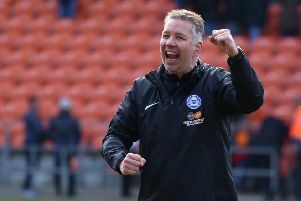 Peterborough United chairman Darragh MacAnthony will speak to the Peterborough Telegraph exclusively tomorrow (April 11). The interview with PT Posh writer Alan Swann will be screened live on the Peterborough Telegraph’s Facebook page from 3pm. MacAnthony has promised a ‘no-holds barred interview’ on this season. next season and on his decade at the club. A write-up of the interview will be published online later day and a more in-depth version will appear in Thursday’s printed edition (April 13). Any questions for the chairman can be submitted to alan.swann@jpress.co.uk.